So in the afternoon we drove out of Barcelona and wandered around a warehouse district along the waterfront until we found the building where Paltrow was filming a commercial for Freixenet. 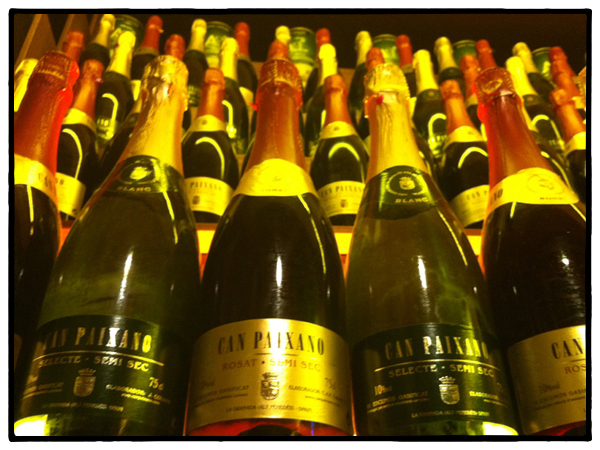 The cava producer is famous for their elaborate television commercials which air in Spain over Christmas every year. In fact, the Spaniards look forward each year to viewing the new ads. Paul Newman shot a Freixenet Christmas commercial in 1989, Meg Ryan did the 1997 ad, and other stars have included Penelope Cruz, Antonio Banderas, Kim Basinger, and, back in 1981, Gene Kelly. Quite a line-up. Anyway, they were doing a new Christmas commercial with Gwyneth Paltrow and Ángel Corella, the astonishing Spanish dancer (and current artistic director for Barcelona Ballet), and we were invited to watch. After spending most of the afternoon watching them shoot the commercial, here’s what I can tell you: It’s boring (in three hours they may have shot 5 seconds of the commercial); and Gwyneth is very beautiful (Ángel didn’t make an appearance while we were there). During a break, she came over, shook my hand, and said, “Hi.” I said hi back and commented on her dress. She said, “Oh, thanks.” That was about the extent of our conversation (I kind of doubt that she and Chris Martin will be sending me a Christmas card this year, but you never know). If you take a look at the complete commercial, below, what we watched being filmed was the snippet about 30 seconds in to the commercial where Gwyneth is surrounded by a bevy of beautiful women in shimmering gold gowns raising up glasses of cava. By the way, there wasn’t really any sparkling wine in the glasses. They were the sort of glasses you buy as joke gifts that have the liquid sealed inside with plastic tops. So not only can’t you drink them, but they also never spill. A good thing while shooting a commercial for sparkling wine over and over and…. In Catalan, when you feel like going out for tapas, you say, “Fer el vermut.” The precise translation is “Go for vermouth,” perhaps because in Spain you never get a drink without also getting a bite of food. The two go hand in hand. And although the drink of choice at most tapas bars these days is a glass of wine, sherry and vermouth are also very popular. We don’t think much about vermouth in the States. We might put a drop or two of dry vermouth in a martini or half a shot of sweet vermouth in a Manhattan, but that’s about it. Almost no one drinks it straight. Which is a shame. Because if you’ve ever had a first-rate vermouth, it’s a wonderful aperitif, as I’ve discovered, and an ideal beverage with most tapas. Almost every region in Spain has their own special vermouth. Yesterday after visiting a couple of wineries in Priorat and Montsant, Eva and I stopped for lunch at the Celler de L’Aspic restaurant in the tiny little town of Falset. 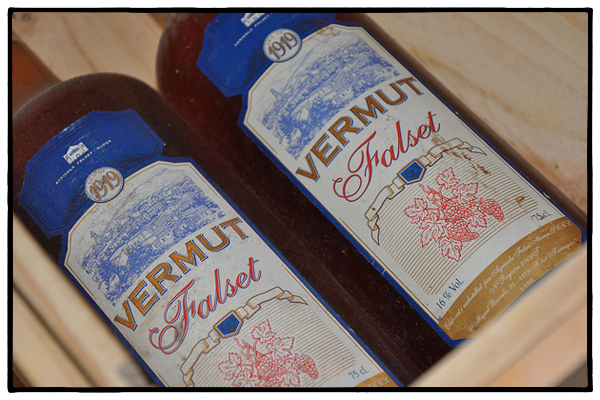 I was just about to order a glass of wine at the bar when I spotted the bottle of Falset Vermut. It was so unlike any other vermouth I’ve ever had; light orange in color with a nose of honey and orange and some complex herbal notes—perhaps lavendar? It was so delicious I bought a bottle to bring home with me. Now if I can just resist drinking it before we leave. Cava is Catalonia’s very own take on France’s Champagne, a fruity, sparkly, sophisticated treat made with methods stolen from Spain’s Northern neighbour in the 19th Century. The homeland of Cava is the Penedès region, located approximately 40km southwest of Barcelona. The region is surrounded by rough and rocky elevation of Montserrat, and enjoys an ideal climate for wine-making. In Spain a toast isn’t a toast without Cava, and so naturally during holidays, especially Christmas Eve (La Noche Buena) and New Year’s Eve (La Noche Vieja) the refreshing sparkling wine is particularly popular. However the fun-loving residents of Barcelona don’t need a special occasion to enjoy a glass of bubbly, and year round they can be found tucking into a glass at ‘Xampanyerias’ or ‘Champagne Bars’ dotted around the city. Find our guide to the best Cava bars in Barcelona below and if you find yourself in town, it’s well worth dropping by one to sample the authentic, bustling atmosphere of Catalans at play. Do like most young Catalan do and grab a quick bite and a glass before hitting the clubs. A traditional Cava bar will close at 10 or 11pm, so make sure you are in before 8pm to find some coveted personal space and enjoy your tipple accompanied by a ´bocadillo´(Insider’s-tip: Cava without tapas is as inconceivable as Barcelona without La Sagrada Familia, the two simply belong together! Often these tapas will take the form of bocadillos, small and tasty sandwiches). 1. Xampañyería Can Paixano. C/De la Reina Cristina 7; www.canpaixano.com. 2. El Xampanyet. C/Montcada 22. 3. La Vinya del Senyor. Placa Santa Maria 5. 4. Cavamar. C/Vila Joiosa 52; www.cavamar.com. 5. Clos Montblanc. C/Pau Claris 169; www.closmontblanc.com. 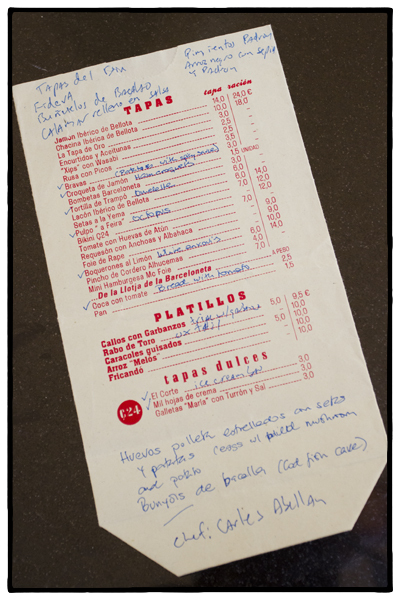 Our paper bag menu (and my notes) from Tapas 24. Photo by David Lansing. First night in Barcelona and everyone (including me) is feeling a little groggy so we decided to blow off our reservation at Moo and go for finger good at Carles Abellan’s Tapas 24. The menu comes on a paper bag. Eva passes it around and everyone makes a checkmark next to something that looks interesting: tortilla de trampó, pulpo a feira, buñuelos de bacalao. I pick the rabo de toro (oxtails). And the boquerones al limón. (I’m addicted to these white anchovies.) We also get Barcelona’s iconic coca con tomate, some bravas, croqueta de jamón—what else do we need? Ah, something to drink. The waitress convinces us to try the house sangria de cava. It’s fantastic. Perfect with everything we order. I’m such a fan that I ask the waitress to write down the recipe for me. Here it is. Mix together 1 part white rum (or vodka, if you prefer), 1 part Cointreau, and 1 part brandy. In a large pitcher, add slices of lemon, orange, and peach. Add a can of Squirt or Orangina. Fill to top with cava. The Pazo Baion, now a winery, was once owned by a Spanish druglord. Every once in awhile while driving through the Galician countryside, you see some enormous stone mansion that looks like something out of Downton Abbey. They are called pazos in the Galician language (yes, they have their own language up here) and were built as country manors by ostentatious Spaniards who made a fortune in the New World and then came home to show off their wealth. 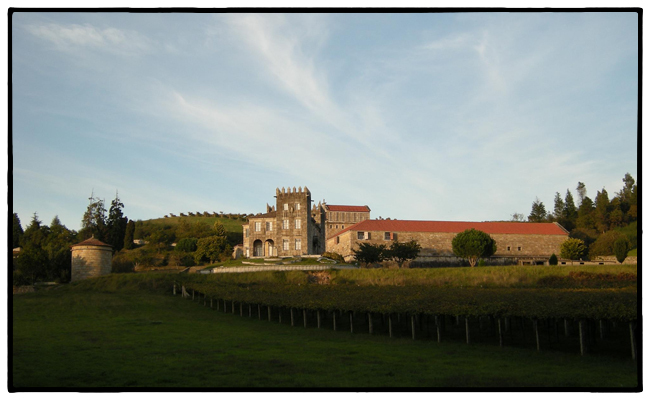 We visited one, called Pazo Baión, that is now a winery and event center. Pazo Baión was built by Adolph Fojo, an emigrant who made his wealth in the U.S., back in the 1920s. It was then purchased in the 80s by the notorious drug dealer, Oubiña Laureano, and his wife, Esther Lago, before being seized by the Spanish government in 1995. After that, the 287 acres of prime Albariño vineyards were leased by Vionta which is owned by the massive Spanish winemaker Freixenet. After years of legal wrangling (when Spain tried to sell the property in 2007, the daughters of Oubiña Laureano claimed that the palace was part of their inheritance following the death of their mother, who died in a car crash), the pazo and the vineyards were sold to Condes de Albarei, a wine collective, in June, 2008 for a little over 15 million euros. Originally, Freixenet was determined to continue producing Vionta wines from the estate, but the new owners have decided that the entire property needs to go into rehab to cleanse itself of its drug connection. The pazo is now the centerpiece of an effort to increase wine tourism in the Rias Baixas region.